The Lean Startup is a human institution designed to create a new product or service under conditions of extreme uncertainty. The Lean Startup takes lean manufacturing concepts and applies them to the process of innovation in uncertain environments. Startup productivity is not about how much stuff you are building (or dollars, awards, press, vanity metrics) but how much validated learning you are getting. You must have a hypothesis in order to have validated learning. Startups need to have a value hypothesis (how does the product or service deliver value?) and a growth hypothesis (how are customers discovered?). 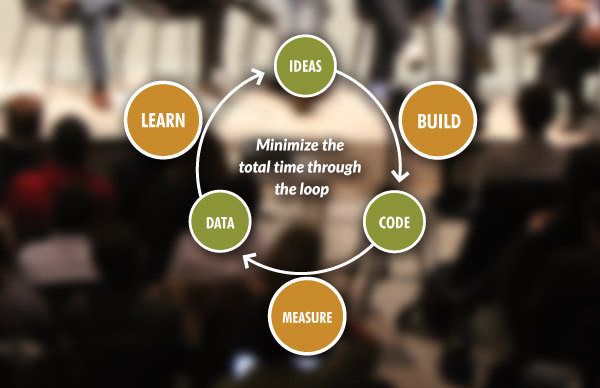 The goal is to minimize time through the Ideas BUILD – MEASURE – LEARN feedback loop, which is another way of describing the scientific method. To do so, you first need to ask what you want to learn (what is your growth or value hypothesis)? From that… How will you measure your learning outcome (metrics)? From that… What do you need to build (minimum viable product) to measure it? Minimum Viable Product – building something to test your growth or value hypothesis with minimum effort and the least development time. The idea is to remove any feature, process, or effort that does not contribute to validated learning. 5 Why’s – when encountering any problem, get to the root cause by asking why 5 times, and then spend proportionally more time on the root cause. A pivot is a special kind of change designed to test a new fundamental (and strategic) hypothesis about the product, business model, and engine of growth. Pivot types include Zoom-in, Zoom-out, Customer Segment, Customer Need, Platform, Business Architecture, Value Capture, Engine of Growth, Channel, and Technology. You want to pivot before you scale. Eric Ries, author of The Lean Startup, summarizes lean startup principles on his book page. Entrepreneur and lean startup proponent Ash Maurya describes the stages of successful start-ups similarly in his book Running Lean. Problem / Solution Fit: do I have a problem worth solving? Product / Market Fit: have I built something people want? Scale: how do I accelerate growth? Maurya emphasizes focusing on learning and pivots before Product / Market Fit, focus on growth and optimization after Product / Market Fit.